A couple of computer manufacturers took it upon themselves to package and distribute the Scott Adams adventures for their particular machines. 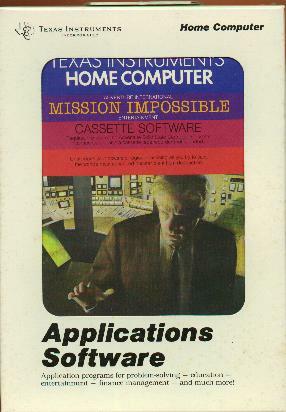 Texas Instruments published the original twelve games in their own boxes. A cartridge containing the game-file interpreter was packaged with a Pirate Adventure cassette. The other eleven adventures were sold separately, but you needed the cartridge (called a "command module") to play any of them. The TI packaging was as plain and unremarkable as you can get, except for Mission Impossible, which actually had some cover art (likely intended to make people think of a certain TV show with the same name).